With no errors or faults in performance, the Venterior Portable Fish Finder with Wired Sonar Sensor Transducer and LCD Display seems to be one of the best choices for the customers. It comes with all the necessary features and the complete package of accessories is provided for your convenience. Most of the users who bought it were completely satisfied and contended with what they received for the price. LCD displays have made our lives much easier and better. Being a modern and advanced system interface, the LCD display is much better than a manual counter. The fish finders have been improved when it comes to technology and has made things much easier as well. LCD display fish finders are the thing of the 21st century. Have the best of fish finders for your fishing experience from our website. The Venterior Portable Fish Finder with Wired Sonar Sensor Transducer and LCD Display is an example of such a fish finder which comes with an LCD display. Find out more about it in the review below. Keep one thing in mind that the transmitter is completely waterproof and that is going to be a great addition to your fish finder which will also prolong its life. However, the receiver is not waterproof so you must be careful of keeping the screen away from water. Another thing which can be kept in mind is the fact that the portable Venterior Fish Finder which includes a Wired Sonar Sensor Transducer and LCD Display cannot be used to detect bait fish or fish which is smaller than 10cm. However, it can definitely detect and display water depth and approximate fish location of the bigger fish. It will also display short and tall weeds as well as sand and rocks on the sea bed. 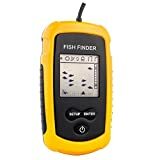 There are various feature settings of this fish finder as well which includes the sensitivity level that can be adjusted by the user as well. Other settings include battery save mode, backlight mode, fish alarm, and unit of measure. Water depth shows by two different units of meters and feet. There is a round transducer sensor which comes with a 25 feet cable and has a removable transducer float a well. You can use it to find out the depth range between 1m and 100m. The Venterior Portable Fish Finder by turning off automatically after staying not in use for 5 minutes. The entire package includes Fish Finder Display, Sonar Sensor (Transducer) with 25ft Cable, Removable Transducer Float with Rubber Stopper, Transducer Side-Scan Adapter, Stainless Bolt and Wing Nut, Neck Strap and an Operation Manual as well. We believe that you should get this fish finder as well and have a perfect experience of catching out fish. If you feel that this is the right one for you, get it from amazon.com right now!